Speakeasies are of another time, a bygone era of romance, when simply taking a drink could land you in jail. Everything felt dangerous. 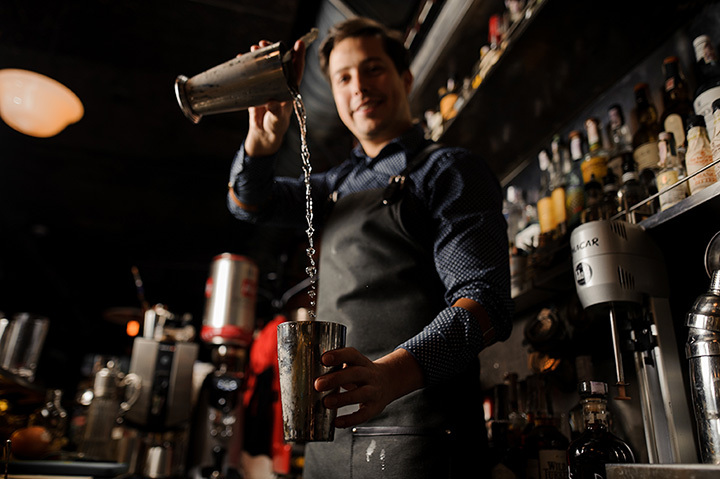 If you crave a little taste of that mysterious thrill, or are nostalgic for a time gone by, consider shaking up your usual watering hole with one of the following speakeasies in (and around) Kansas! What’s a great speakeasy got to have? A hint of secrecy? Check. A fine selection of gin and tonic? Check. A little bit of danger? Well… how about perceived danger? The roleplay, not-going-to-go-to-jail kind? 324 Speakeasy checks all the boxes and then some. HUSH is home to some of the best regularly scheduled live music options in Kansas City. This moody, atmospheric speakeasy pays homage to the speakeasies of yesteryear while charting a course to modern-day-bar-brilliance. Check them out for a great time. You don’t need a password for the speakeasy underneath the Rieger, but you do need to know where to look. Here’s a hint: head to the back and look for a greeter. He’ll show you where to go. We’d tell you more, but what fun is that? Suffice it to say that you won’t be disappointed. Stepping into the Historic Wolf Hotel in small-town Ellinwood is like stepping into a time capsule. Go deeper into the building and you’ll find the Underground Saloon/Bar, a “prohibition style speakeasy” run by management. You’ll need a secret password that changes weekly. Find the password on Facebook and tell it to the full costumed doorman, Mr. Westerman, for entrance. Dockum in Wichita, Kansas is a “Speakeasy-style bar serving exquisite craft cocktails.” They make their bitters and syrups inhouse and promise that their small bites “will cure any ailment.” Established in 1926, current-day Dockum invites visitors to travel to another time and place. Located underneath the Ambassador Hotel Wichita, the drinks take time to create but are well-worth the wait. Manifesto, a previous James Beard Semi-Finalist, continues to redefine the modern-day speakeasy. According to its website, “This cozy bar is located in the basement of the Reiger, originally a hotel built in 1915.” It operated as a speakeasy during prohibition and continues showcasing creativity and excellent cocktail craftsmanship today. Swordfish Tom’s is a “pre-prohibition, premium spirits and cocktail bar,” with a focus on hospitality and creating delicious cocktails. Like most speakeasys, space is limited and reserved for first-come-first-serve, so make sure to stop by early if you’re intent on getting a spot. The menus have a somewhat political bent (can I interest anyone in a Stormy Daniels, made with Jack Daniels Rye, Fresh Lemon, House-made ginger syrup? ), so if that’s not your thing, consider another option from the list. John Brown’s Underground in Lawrence, Kansas serves Cocktails, Spirits, and Freedom, according to their Facebook page. From a recent review by Ryan Miller at www.kansan.com, “Tucked away off the beaten path…lies the entrance to a hidden gem. Walking into the speaks is a blast from the past. A green light is turned on when it’s open and photos from the early 1920s line the walls… mostly lit by flickering candlelight.” They’ve only got space for 90 people and won’t let anyone in past that. Keep an eye on the light outside for when it turns from green to red to know if there’s space. According to legend, “Dora Mae cleaned out the basement of Walters’ Plumbing and gave Manhattan” a speakeasy worth writing about. It reopened in 1974 and has been quenching Kansan thirst ever since. They also have trivia every Wednesday and music almost every weekend. The Ship was “a grand lounge opened shortly after the repeal of Prohibition in 1935…by Ethel Mae Wright, companion to a gentleman of means and questionable repute.” After decades of changing hands, it was reopened in 2014 by the current owners to bring back the original speakeasy feel. Live music plays most nights and fantastic drinks are available every night.